The USB-COMi-M USB-to-RS-232/422/485 Serial Adapter is designed to make serial port expansion quick and simple. Connecting to a USB port on your computer or USB hub, the USB Serial Adapter instantly adds a RS-232, or RS-422, or RS-485 serial communication port to your system. By taking advantage of the USB bus, the USB Serial Adapter makes it easier than ever to add serial ports and serial devices to your system with easy plug-and-play and hot plug features. By plugging the USB Serial Adapter to the USB port, the adapter is automatically detected and installed. There are no IRQ & COM port conflicts, since the port dont require any additional IRQ, DMA, memory as resources on the system. The adapter is powered by the USB port, and no external power adapter is required. The adapter is designed with an external 4-pin dip switch to set RS-232, RS-422 or RS-485 mode conveniently, without the need to open the metal chassis. Both a 6-pin terminal block and a DB9 male connector are available for optimal flexibility for serial connection. The adapter also provides a unique feature of supplying power output of 5V/150mA through pin-5 of the terminal block to serial device. The adapter is with DIN rail bracket for industrial environment. Termination and biasing option are available for data transmission lines. 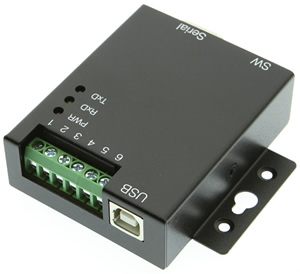 The USB-to-RS-232/422/485 Adapter provides instant connectivity to RS-232, RS-422, RS-485 communication devices for POS, factory automation equipment, multi-drop data collection devices, bar code readers, time clocks, scales, data entry terminals, PC to PC long distance communications, ATMs and serial communication in harsh environments. FIFO: 128 byte transmit buffer 384 byte receive buffer Serial port speed up to 230K bps One DB9 male connector & one 6-pin terminal block Supplies power output of 5V/150mA through pin-5 of terminal block for serial devices requiring power. Serial port speed up to 230,400 bps or 921,600 bps depending on the model. 384 byte receive / 128 byte transmit buffering. The USB-COM series items support Windows 98, ME, 2000, XP, Apple MAC OS8 or higher, Linux 2.4.0 and later, OpenBSD 2.9 and later & FreeBSD 4.7 and later. Drivers for the Windows operating systems are included on a CD-ROM disc. The latest versions of the Windows drivers as well as the drivers for Apple OS8/OS9/OSX, & Windows CE.NET (version 4.2 or greater) can be downloaded from http://www.ftdichip.com/Drivers/FT232-FT245Drivers.htm. Linux, OpenBSD and FreeBSD support the adapters directly, so no driver is necessary.